I was born and raised in Ukraine. 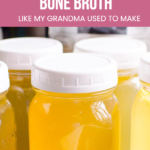 I will share with you how my family made bone broth since 19th century. Or I bet you even earlier before it became trendy. Of course, it was not Instant Pot bone broth but rather simmered for a day broth. 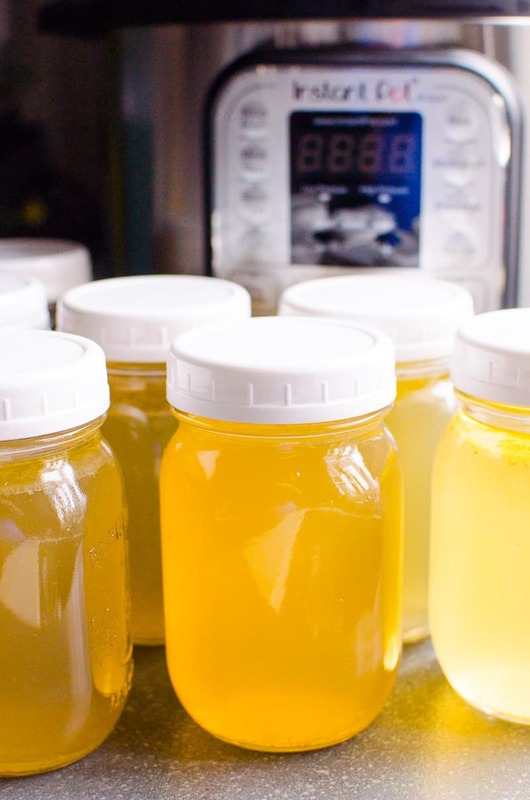 We are super lucky to be making bone broth in a pressure cooker. A truly miracle appliance. You don’t have to buy bone broth in a form of pills. I think they are ridiculously expensive and unnecessary. Make it at home and enjoy the same health benefits! According to Medical News Today, one word – collagen. The longer you simmer the bone broth, the richer flavor and higher collagen content. Collagen seeps out from bones and connective tissues during long-term simmering. Cooking collagen turns it to gelatin, which provides the body with amino acids, which are the building blocks of proteins. #1 health benefit of collagen is joint health. Cartilage in our joints wears down with continual use and time. Consuming bone broth may be a good way to add gelatin to our diet. It may help reduce stress on joints as well as promote healthy nails, hair, skin and stronger immune system. Chicken bone broth is higher in Omega 6. Type of fatty acids that are found in vegetable oils used for frying processed foods. It is one of Western Diet’s problem – we consume 5 times more Omega 6 than our ancestors. Beef bone broth is higher in minerals. Chicken and beef bone broth taste differently. My family always made bone broth with beef. And that is what I make these days. For beef, I highly recommend to use beef or bison soup bones. Or wild meat bones like deer, moose or elk. Simple. In case you want to use chicken bones, I suggest to use carcasses from 2 whole chickens. Make Instant Pot whole chicken a few times and stash the bones in your freezer. And because chicken bones do not contain as much collagen as beef, I recommend to add chicken feet. Broth will have higher protein and gelatin content. My Instant Pot bone broth recipe is super simple. This is how my grandma used to make it. And that’s how I make it, without any vegetables. And it comes out super flavorful! In Instant Pot, add bones, bay leaves, peppercorns and water. That’s it. Close the lid, turn on Pressure Cooking on High for 2 hours, turn vent to Sealing position. Walk away. A few hours later, open the pot and you are looking at bone broth. Remove bay leaves, peppercorns and large floating pieces of whatever that is with small mesh strainer. Don’t look for perfection because we will be putting broth through a mesh strainer again. I like to add salt after pressure cooker bone broth is cooked. Simply because I like to adjust salt to taste and it really doesn’t matter when you salt it, before or after. 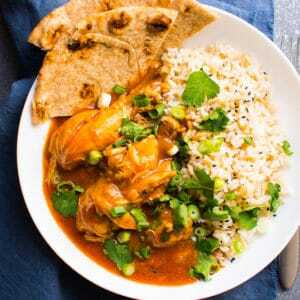 For 6 quart Instant Pot add 2 tsp salt; for 8 quart add 1 tbsp. Then stir. Once you stir, immediately you will notice “the build up” on the back of the spoon. It’s all the goodness of a bone broth in its glory – collagen and fats. For any food storage, I prefer glass jars. Any size. I used 16 oz ones but I think larger ones are better since you will need a few anyways for making a batch of soup. 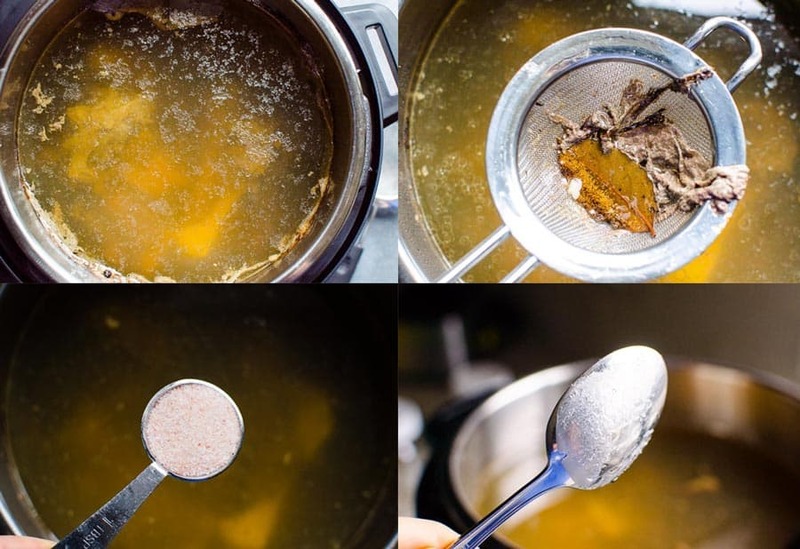 Just pour broth with a ladle through a mesh strainer, placed inside a funnel, into the jar. Can I Freeze Bone Broth? Of course. 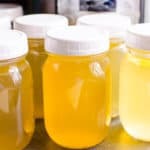 Freeze bone broth in same glass jars for up to 3 months. Just when you pour leave some room for expansion. 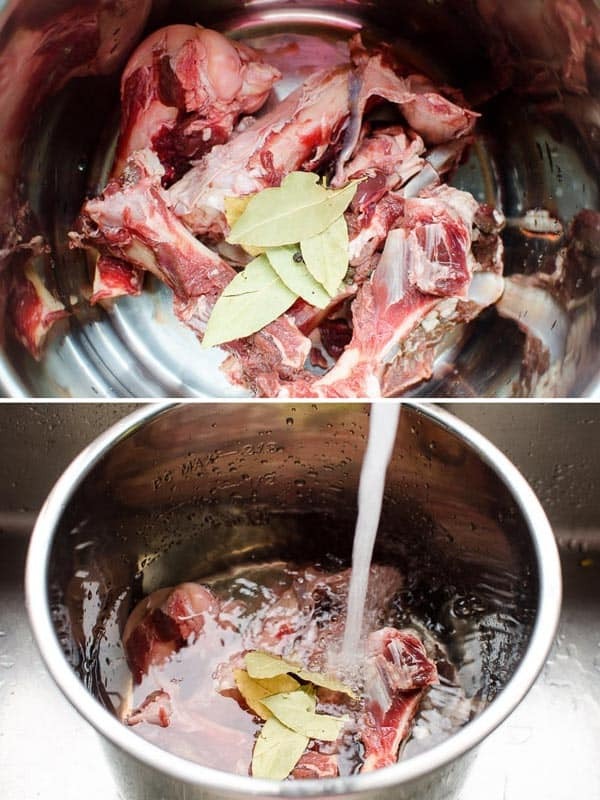 What to Do with Meat and Bones After? After distributing most of the broth among the jars, you will have bones with some meat, tissue and liquid left. That’s more goodness on the bottom of the magic pot. 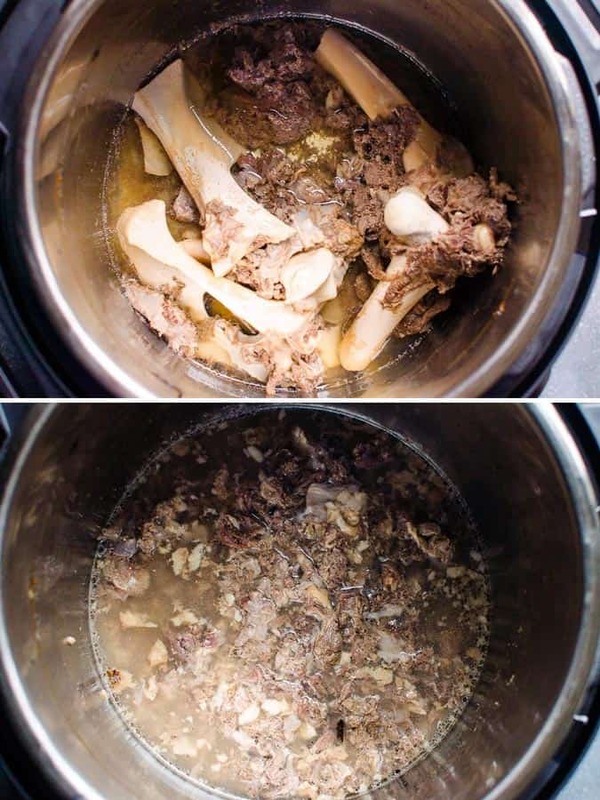 Bone broth in Instant Pot just keeps on giving. Before I get rid of the bones, I make sure to scrape the meat and tissue off of them really well. And if you look closer inside the bones you will see the bone marrow. Knock bones on the side of the pot a few times and it will come out. What do you do with all of this?! Make some soup. For example, Instant Pot split pea soup. 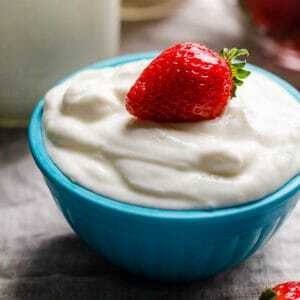 Instant pot yogurt – full of probiotics and good for your gut bacteria. So easy, you will never buy yogurt again. Instant pot chicken noodle soup – Rich and flavorful chicken broth based soup. 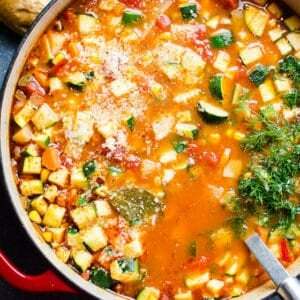 Instant pot borscht – Traditional Ukrainian soup chock full of vegetables, with beef bones if you wish. My family’s simple pressure cooker bone broth recipe they made for centuries in Ukraine before it became trendy. In Instant Pot add bones, bay leaves, peppercorns and fill up with cold water 2/3 full (older models) or up to PC Max line (newer models). Don’t fill it up to the Max line near the edges, there needs to be room left for pressure to build up. Close the lid, set pressure vent to Sealing and press Pressure Cooking on High for 2 hours. Display will say ON, Instant Pot will take about 20-30 minutes to come to pressure, you will see a bit of steam coming out from a valve, then float valve will rise and countdown will begin. After 2 hours your bone broth is ready, Instant Pot will beep, display will say OFF and now it needs to bring pressure down before you can open it, which will be indicated by a dropped down float valve. You can let it do it on its own which will take less than an hour – Natural Release. OR you can do Quick Release by turning pressure valve to Venting position, which takes 3-4 minutes. I recommend doing so outside to avoid the mess and smell. Using small mesh strainer, discard bay leaves, peppercorns and large floating pieces of whatever that is. 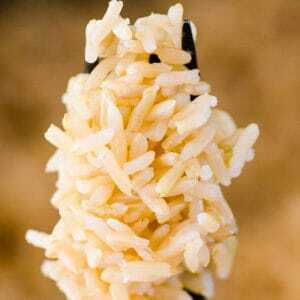 For 6 quart Instant Pot, add 2 tsp salt; for 8 quart, add 1 tbsp. Stir. Now you have to portion bone broth. 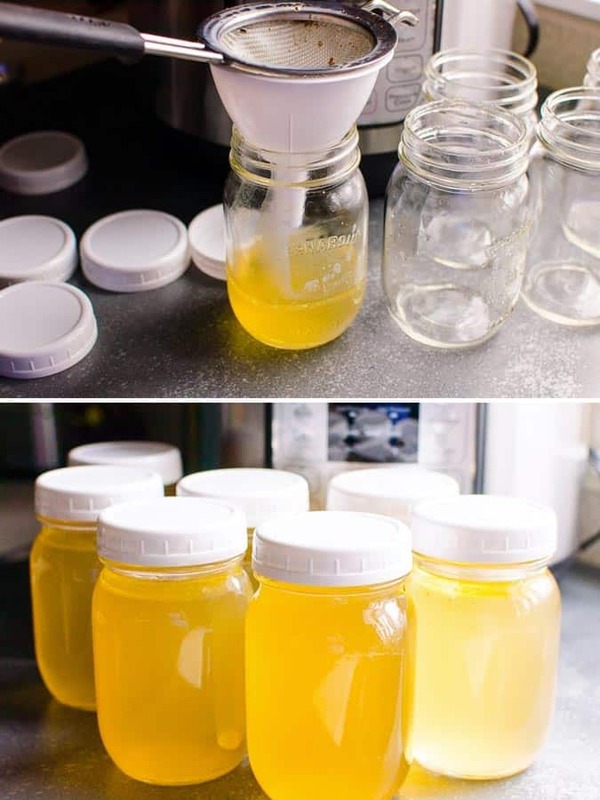 I like to pour it into glass jars (any size) through a mesh strainer placed inside a funnel. That’s it. 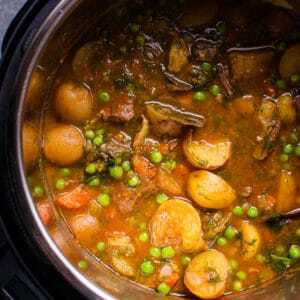 Use in soups or drink hot with fresh herbs and more spices. Store: Refrigerate for up to a few weeks or freeze for up to 3 months. Besides beef bones, you can use moose, deer or bison bones. If you want to use chicken bones, I recommend to use full carcasses from 2 whole chickens + some feet for extra collagen and protein.